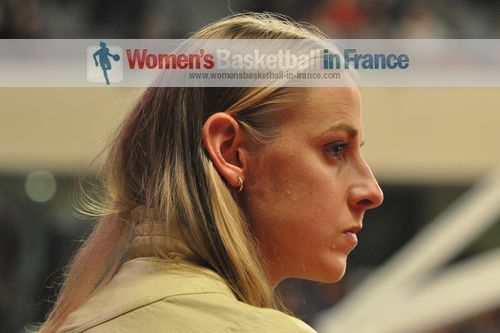 Bourges Basket left it late but won their fifth EuroLeague Women match of the season. This victory keeps them in second place in Group A at the halfway point of the regular season group phase. For the other French clubs, USO Mondeville got back to winning ways while Arras are still looking for their first win. In Group A, Sparta&K M. R. Vidnoje were not brilliant. But thanks to 9 points in the final quarter by Seimone Augustus (18 points) they hung on to beat Rivas Ecópolis (70-68) in a match streamed live by Sparta&K. Elisa Aguilar had 10 points. 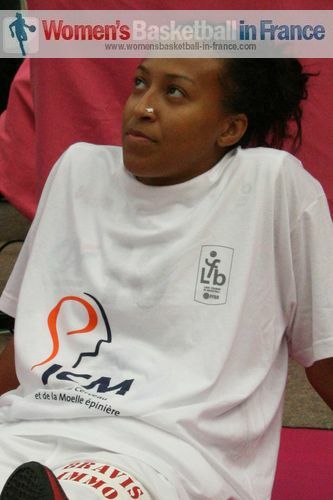 French international Isabelle Yacoubou-Dehoui had 6 points and 9 rebounds. For Rivas Ecópolis Aneika Henry was the leading player with 15 points and 9 rebounds. Bourges Basket made it as difficult as possible for themselves before coming out on top against BK IMOS Brno (63-60). The match was streamed live by basketbal.tvcom.cz (archived game is available for a limited time). The key point of the match came with around six seconds to play when Emméline Ndongue put Bourges in front for good. The 2 free throws at the end by Cathy Joens (in picture) was just cosmetic in terms of the final score (63-60). Nwal-Endéné Miyem, Joens and Ndongue all finished with 11 points. For the hosts Hana Horakova and Romana Hejdova scored 13 apiece. In the final EuroLeague Women Group A game, also streamed live, Wisla Can-Pack got themselves out of jail thanks to a missed lay-up at the end by Danielle Robinson to hold off Tarsus Belediye (74-73). Tina Charles (Wisla Can-Pack) and Shay Doron (Tarsus Belediye) were involved in a shooting contest during the first half of the game with 20 points each. By the end of the game Charles had 27 points and 16 rebounds against Doron's 22 points and 2 assists. Good Angels Kosice ended the winning streak of Municipal Targoviste in style (93-78). Trailing (14-20) at the end of the first quarter, Good Angels - playing at home - went on a 21-3 run during the first seven minutes of the second quarter (35-23) to never look back. Plenette Pierson (Good Angels) with 21 points was the leading scorer in the match while Monique Curry had 18 points for Municipal Targoviste. (All Good Angels Kosice home games are broadcast live). Orenburg Nadezhda (70-80). It was difficult for Arras to get into this game after falling behind (4-17) with six minutes played. Nadezhda controlled the rebounds at both ends of the court and paced themselves the rest of the way with Renee Montgomery leading the way with 20 points. For Arras Olesia Malashenko was the leading scorer with 16 points. Famila Schio beat Fenerbahçe SK in the final game of week (74-69) to move into first place in the group. Jantel Lavender finished with a double-double of 24 points and 12 rebounds while Danielle McCray and Kathy Wambe contributed 18 and 16 points in the victory. In EuroLeague Women Group C, FIBA TV broadcast the match between the two unbeaten teams with UMMC Ekaterinburg coming out on top against Galatasaray MP (71-70). The game was not very exciting despite the suspense. However the tactics used by both coaches were interesting. 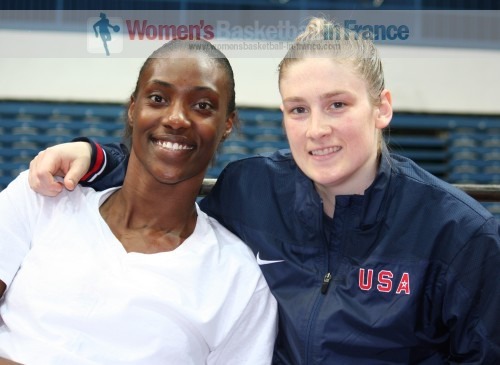 Lindsay Whalen (right in picture) was the leading player from Galatasaray with 22 points, 8 rebounds and 6 assists while her team twin towers, Sylvia Fowles (left in picture) and Sancho Lyttle scored 13 and 11 points each. For UMMC it was a collective effort with 20 points and 3 steals coming from Deanna Nolan, 16 points apiece from Sandrine Gruda (2 blocks), Candace Parker (9 rebounds) and Diana Taurasi (6 assists). Taurasi missed her first free throw of the ELW season in this match after having connected 27 times from the charity stripes beforehand. The two remaining games from this group were not broadcast live by the hosting clubs. USO Mondeville got back to winning ways with a (70-61) victory against ZVVZ USK Prague. Unfortunately the commentators forgot to switch on the radio transmission for the second half of the match (for those following the web radio transmission). USO Mondeville had to pick themselves up from a slow start (0-7) in the first quarter to sneak in front by the break (35-31). 3 three-pointers in a row by Ingrid Tanqueray (15 points) during the the third quarter got the home fans on their feet. Shortly after K. B. Sharp (in picture - 16 points) also connected from the land of many for Mondeville to take a double-digit lead (51-40) with just under 14 minutes to play. It was a game of cat and mouse for the rest of the game. Mondeville were disciplined in defense and held on for a precious victory. Naignouma Coulibaly and Amanda Lassiter had 12 and 10 points each. Perfumerías Avenida snapped their four-game losing streak in the EuroLeague Women by beating Novi Zagreb (87-77) with 19 points coming from Lucia Pascua.